So you have been looking for a good keylogger or spying software. You found pcTattletale. But it is any good? In this article I will give you a complete pctattletale review. 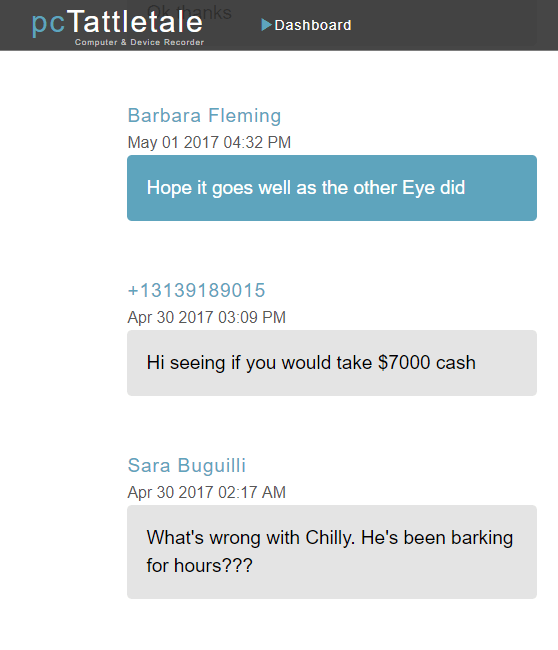 At the end I will link to some 3rd party sites where you can read comments or watch videos from our customers for yourself. pcTattletale is a remote spying software and keylogger. It works on Windows, Android, and iPhone. What you need to know about it is it does not require you to root their Android device. You do not need to jail break their iPhone to use it either. This is important as you look at other solutions. TIP:Jailbreaking or rooting your devices lowers its built in security features. It lets apps get a lot more access to your device. It is not easy to do. You DO need to be somewhat technical to pull it off. We recommend avoiding solutions that require jailbreaking or rooting. Jailbreaking an iPhone is not easy. Most spy software and keystroke logger vendors require you to do it. But not pcTattletale. Jailbreaking an iPhone also voids your warranty. pcTattletale’s approach has been to get you the most amount of information possible without jailbreaking your iPhone. This goes for Android too. 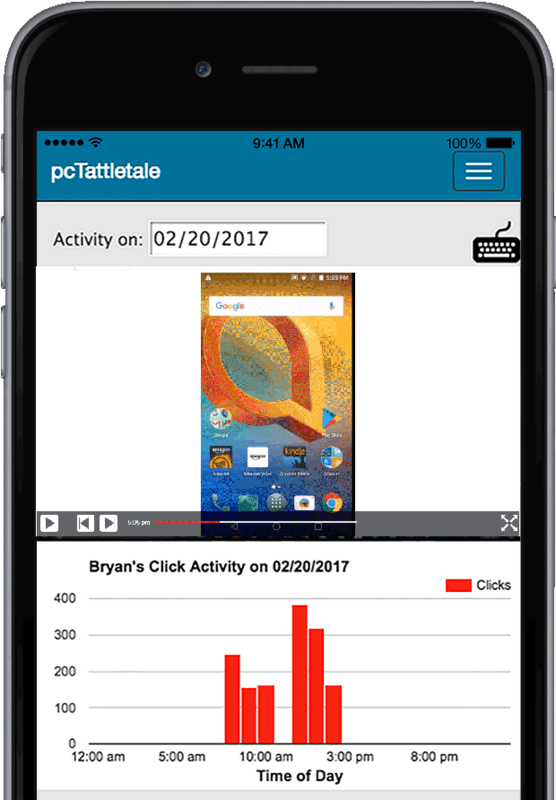 With pcTattletale you just put the app on the device (or computer) you want to record. Then just sign into our website to view the recordings. This makes it a true remote keylogger. After you put pcTattletale on their device you don’t need to touch it again. You can give it to them and then use your cell phone, a tablet, or another computer to watch their every move. pcTattletale for windows records each and every mouse click. It takes those clicks and makes simple YouTube like movies you can watch from our website (You can even watch from your smartphone). Notice how you can see all the common video controls you would expect. You can play the video. Advance Frames. Go back. You can even use the progress bar at the bottom to advance to parts of the movie. Additionally we make a nice bar chart of their click activity. It lets you see things like your kids staying up late at night playing video games when they should be in bed for school the next day. Or what about large gaps of no activity for an employee you are paying. Long lunch breaks? pcTattletale for Windows has an amazing keylogger. 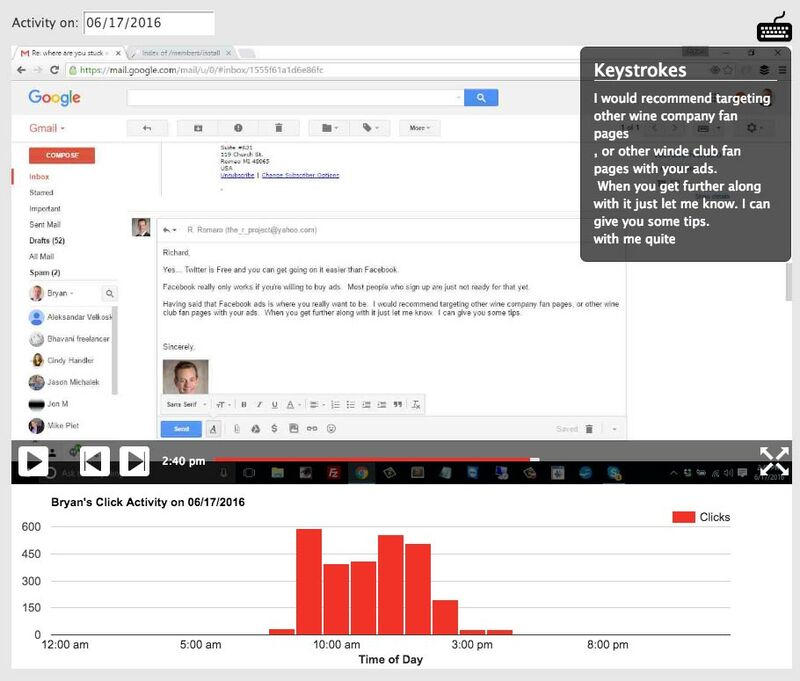 Not only does it capture all their keystrokes (like their facebook password) but it puts them into the video. So as you watch the video you can see what they were typing. What if you don’t know their windows sign in password? No problem. Just sign into your own account on the computer (or make your own account). Once you put pcTattletale on the computer it will record everyone who uses it. Even if you don’t know their password. 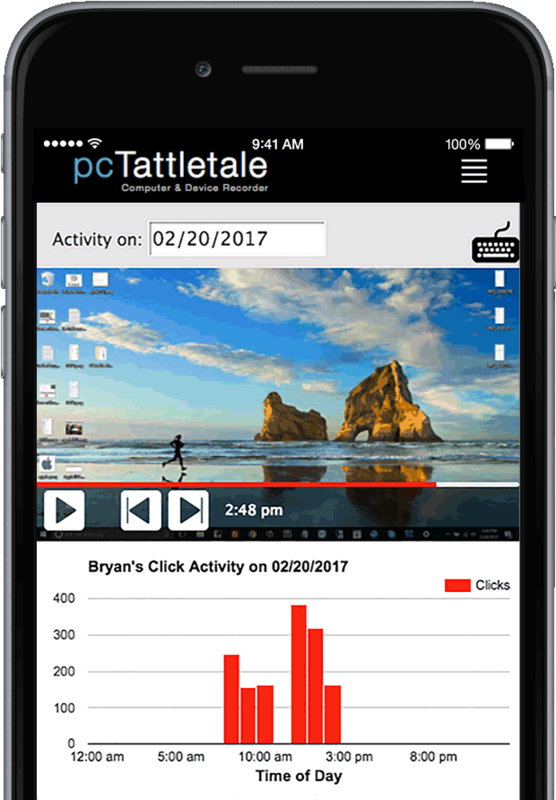 With pcTattletale for Windows you will see everything they do on the computer. It does not matter if they try to be tricky and use “private browsing” mode. pcTattletale will still see it. As I said earlier the most important thing you need to know is that pcTattletale does not need you to root your Android device. No doubt if you have been looking around at keyloggers for Android you have read about this. We believe pcTattletale for Android is by far the best choice. Let’s look at why. Look at the screen shot above. 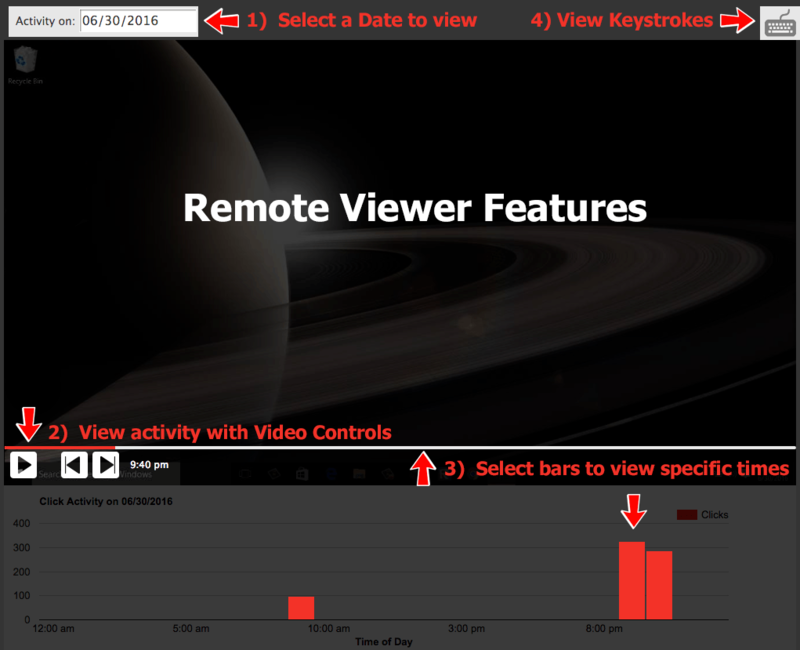 You see the same video controls we offer for Windows. You have the same click chart too. With Android you watch videos of what they do. You can see them type out text messages or emails. What you need to know is that the keylogging ability for Android is handled through these videos. There just isn’t a way to get the keystrokes out like we can for windows without making you root the device. That is just something we did not want to have people do for the reasons listed at the top of the article. pcTattletale for iPhone is a completely different animal. Why? Because we just couldn’t make an app run invisibly and make videos like we can for Android or Windows. Apple just has iOS too locked down. You will see as you search around on Google that every iPhone keylogger needs you to jailbreak your very expensive iPhone. Don’t do that and mess up your warranty and break your iPhone. We also show you everyone they ever called. Every website they ever went to. Plus we show you all their contacts. Let’s suppose your husband is at work on Friday. You open up pctattletlae and find out he’s not at work at all. He’s at a hotel. How about your daughter’s first date? Wouldn’t you want to know where she is at. Especially if it is late and she’s not home yet? Just check pcTattetale and you can see she is at the Friday night football game. Row 6. Again. The thing to keep in mind with pcTattletale for iPhone is that there is no app to install. You do not need to know their unlock code either. In fact it is possible to hook pcTattletale into their iPhone when they are hundreds of miles away. They will have no idea that you are now seeing exactly where they are standing. Plus you just got every text message they ever sent. Here are some videos that customers sent in. You can see how pcTattletale has helped them. The video above is from a mother who uses pcTattletale. She said in her pcTattletale review that she had great success with it watching her daughter. This video is a pcTattletale review from a mother who found out her child was being cyber bullied online. Cyberbullying is getting more and more popular unfortunately. Many kids are victims to it. Listen to her experiences. This pcTattletale review was sent in from a business owner who used it to find out his employees were messing around on Facebook all day. Are your employees doing the same thing? This pcTattletale review was sent in by a business owner who runs an insurance agency. 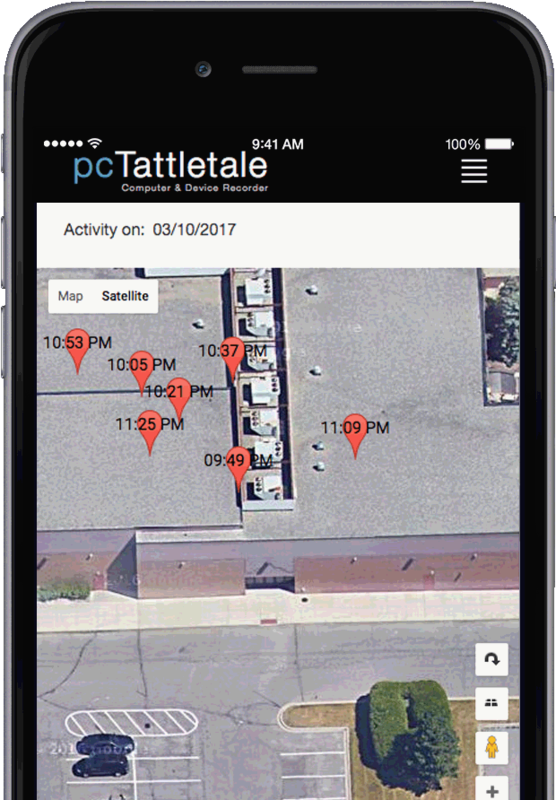 See how pcTattletale helped him keep on top of his worker’s productivity and make sure they are following instructions. Probably the best part about pcTattletale is it’s pricing model. It works on a yearly subscription that you can cancel at anytime. The reason we use a subscription model is because of the costs associated with keeping all your data online so you can view it from anywhere. You can get started with pcTattletale for just $99. That will give you a full 7 days of recordings on up to 3 devices. Mix and match those 3 devices however you want. Maybe you need to monitor 3 Windows PCs. Maybe it’s a Windows PC, an android Phone, and an Amazon Kindle Fire HD. Most spy software and key logger vendors do not offer a money back guarantee. You should be cautious about purchasing software like that from them. What if it doesn’t work for you? You are out your money. Here at pcTattletale we know our products work. We know you will find out what you are looking for. If not we will refund every penny of your purchase. So what you are waiting for? You have no risk at all. You can try pcTattletale free.